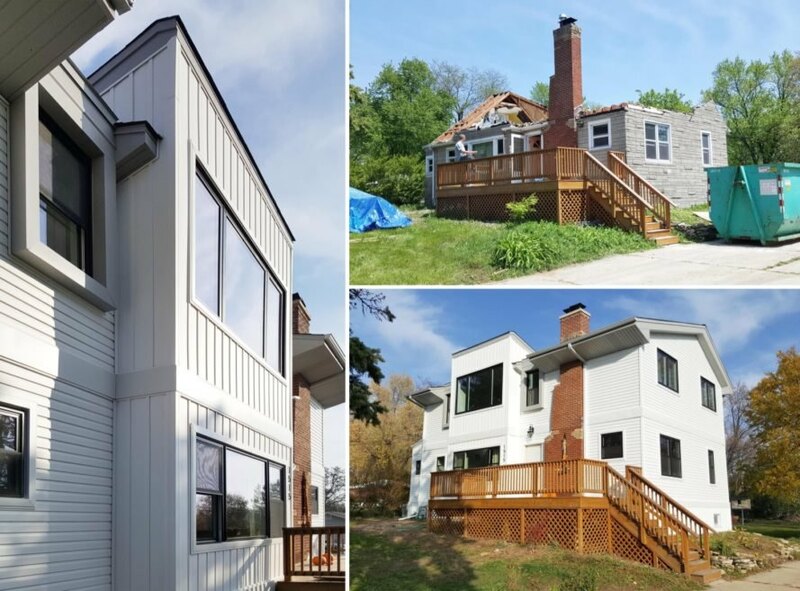 When the homeowners of a small, Cape Cod-style home in Arlington Heights, Illinois wanted extra room for their growing family, they turned to DII Architecture for help. 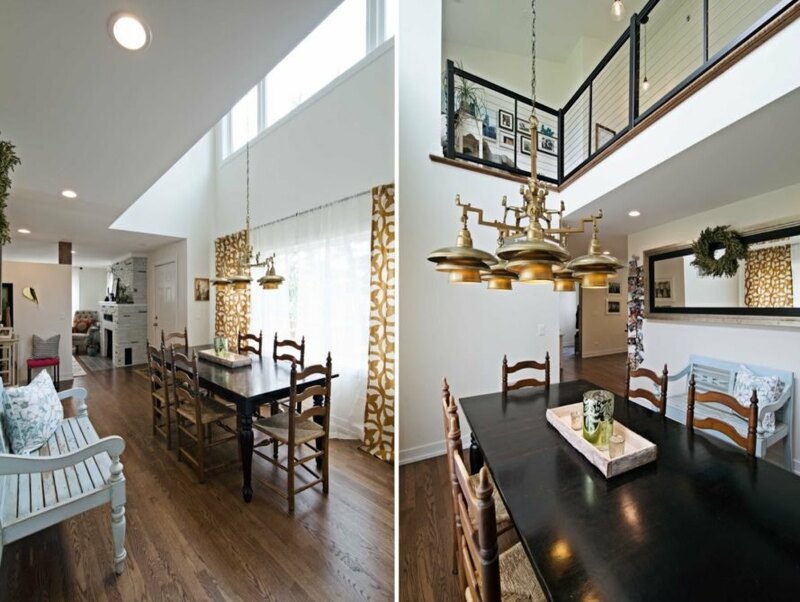 The design/build firm not only added a second floor, but also oversaw a complete revamp of the ground floor. 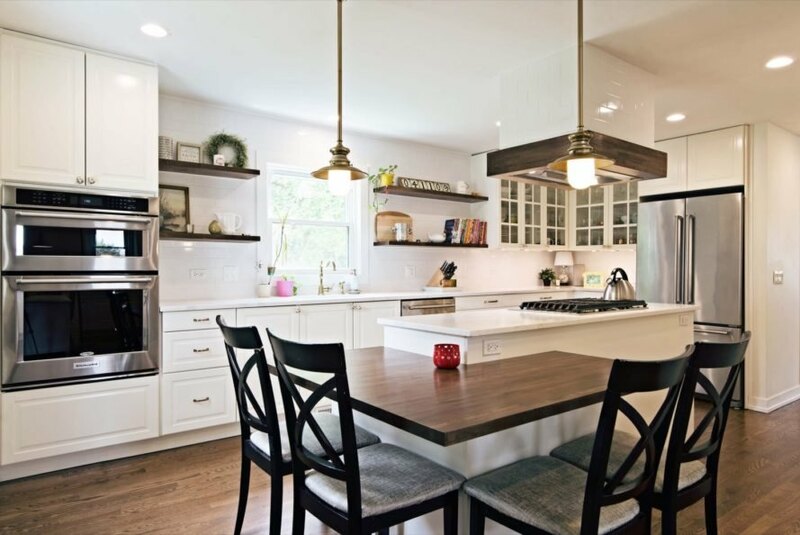 Conceived with a modern farmhouse aesthetic, the Wilke House is now flooded with natural light and features an airy, spacious interior that’s more energy-efficient than before thanks to a new suite of low-energy additions. 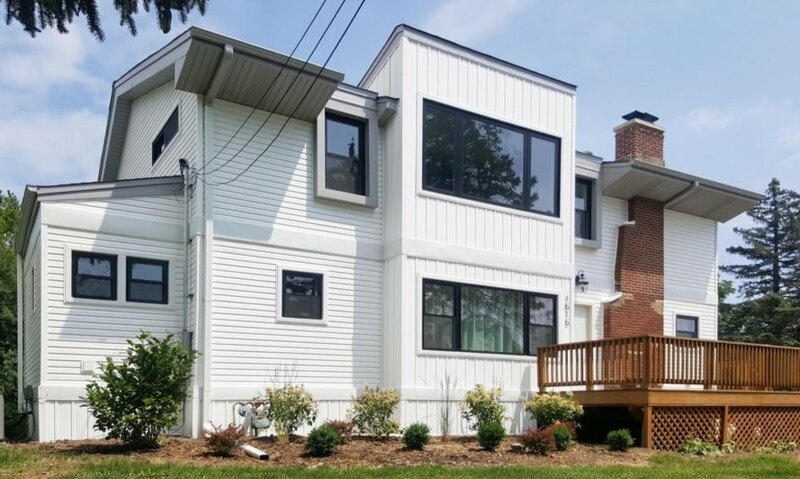 Located on a large three-quarter-acre lot, the 2,150-square-foot home was refreshed with new white siding and a roof clad in Owens Corning shingles. The original Cape Cod attic was demolished and replaced with a new second floor with room for a double-height dining and meeting area that can be seen from above thanks to a new catwalk, which has Feeney DesignRail railings. 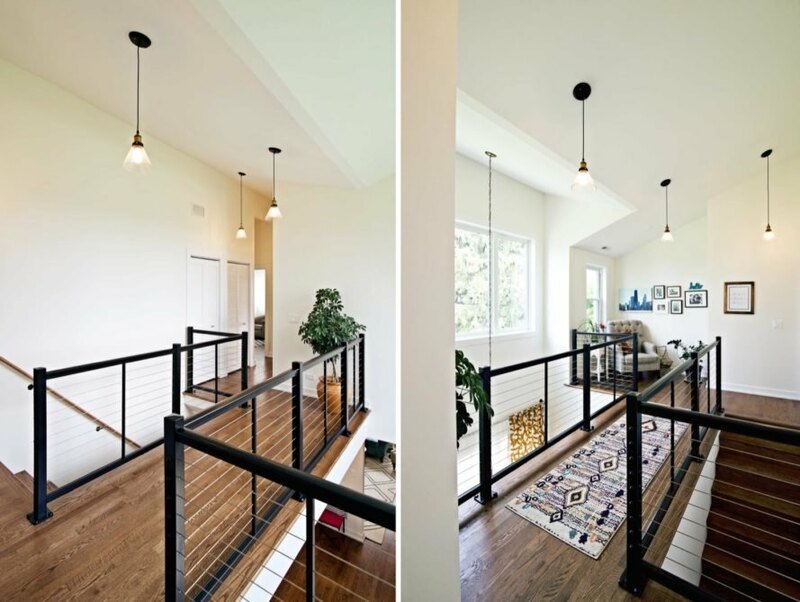 Although the budget didn’t allow for a standing seam metal roof, the Wilke House makes its modern farmhouse influences evident through the material palette of warm woods matched with crisp white paint, extruded window elements, and indoor daylighting. 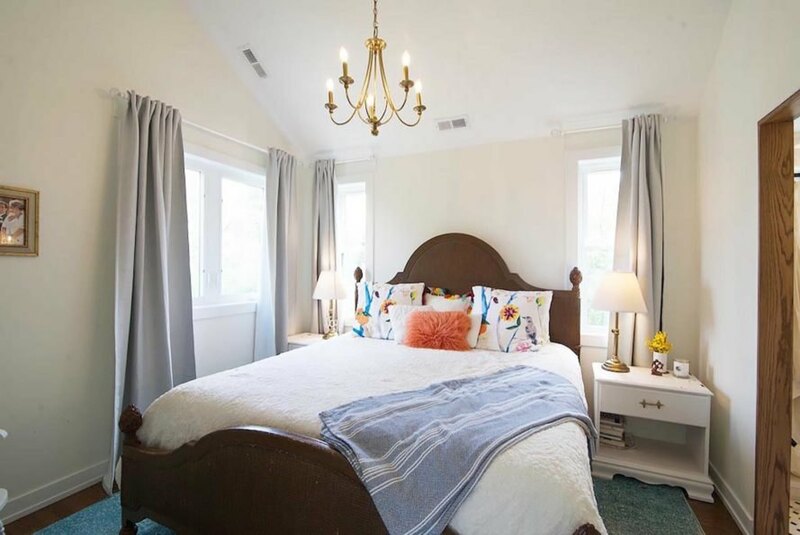 The renovated home, completed for $250,000 in 2016, offers bedrooms for the family’s two kids as well as a guest bedroom for when grandparents and friends visit. The large lot was preserved to provide an outdoor play area for the family’s children and dog. All second-floor rooms feature vaulted ceilings to help create the illusion of more space. The home was inspired by the modern farmhouse aesthetic. Owens Corning shingles clad the roof. Pictures of the renovation in progress. The lot is three quarters of an acre in size. The kitchen with quartz countertops from MSI Stone. The dining room is in a double-height space. The living room is next to the foyer. The catwalk overlooks the dining room below. The master bedroom with a chandelier. A look inside the bathroom. A look at the floor plans, sections, and an exploded axon diagram.